The endangered humpback chub was built to live in deep canyons with swift, turbid water running through them, such as Westwater Canyon, shown here in Sept. 2017, in Utah. 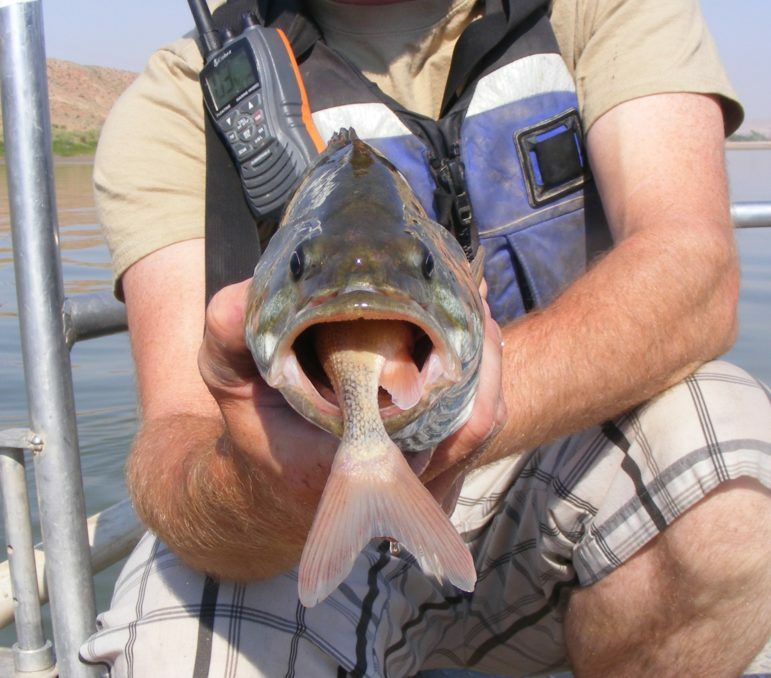 About 2,000 to 3,500 adult humpback chub are estimated to live in Westwater. “It’s difficult for me to find the water in my forecast,” said Victor Lee, a hydraulic engineer with the Bureau of Reclamation during a meeting and conference call March 27 with regional water managers. For the past three years, 29,400 to 35,700 acre-feet of “surplus” water has been released out of various combinations of Ruedi, Wolford, Williams Fork, Green Mountain, Homestake, Willow Creek, and Granby reservoirs to bolster spring flows. 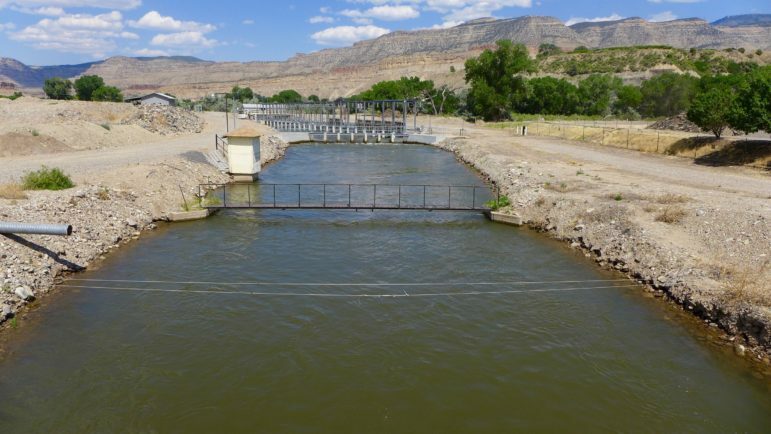 The diversion canal operated by the Grand Valley Irrigation Co. in Palisade normally moves 640 cfs of water 90 miles through the Grand Valley. The 15-mile reach of critical habitat for endangered fish in the Colorado River begins right below the diversion structure for the canal. It is also meant to offset the extensive series of transmountain diversions that occur at the top of the system for Front Range use, and the irrigation diversions from the river system on the Western Slope. In 2017 as part of the Coordinated Reservoir Operations (CROS) program, 35,735 acre-feet of water was released from various reservoirs and diversion systems to run down the Colorado River to the critical 15-mile reach below Palisade. 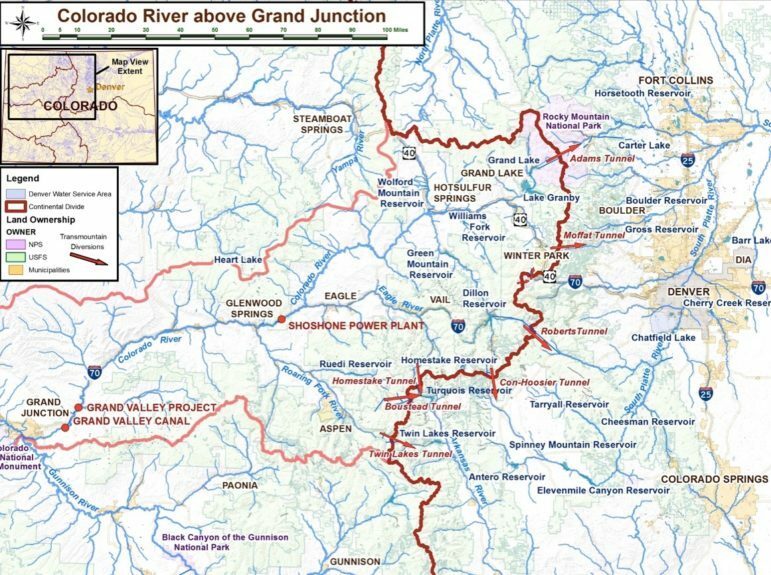 A map showing the Colorado River system above Grand Junction. The 15-mile reach is below the Grand Valley Project and the Grand Valley Canal, and runs to the confluence of the Colorado and Gunnison rivers. 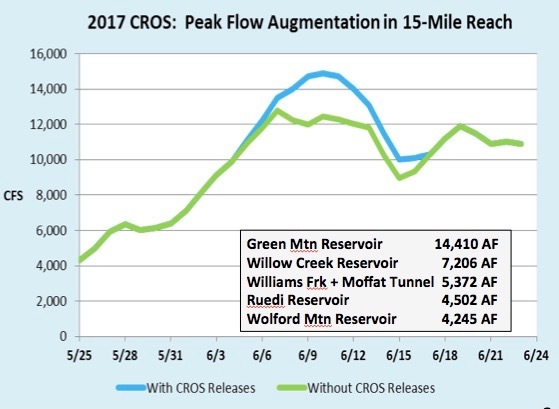 Last year the effort increased the peak flow in the 15-mile reach from more than 12,000 cubic feet per second to over 14,000 cfs on about June 10. Last year, as part of the spring release program, Ruedi Reservoir sent 4,501 acre-feet into the lower Fryingpan River toward the 15-mile reach, causing flows to rise June 2 from 200 cfs to 600 cfs on June 7, before stepping back down to 200 cfs by June 14. Miller still expects to fill up the 100,000 acre-foot Ruedi Reservoir by early July as usual, but there’s not much wiggle room in the forecast, or the snowpack. An illustration of the Humpback Chub from the cover of a November 2017 species status assessment prepared by the U.S. Fish and Wildlife Service. The five-year study prompted federal officials to take steps to begin downlisting the Humpback Chub from endangered to threatened under the Endangered Species Act. The Black Rocks section of the Colorado River, west of Loma and east of Utah, at low water in December 2017. About 400 adult endangered humpback chub live in Blackrocks, but wildlife biologists are concerned about their habitat being invaded during low flows by predatory non-native fish, which prey on young humpbacks. 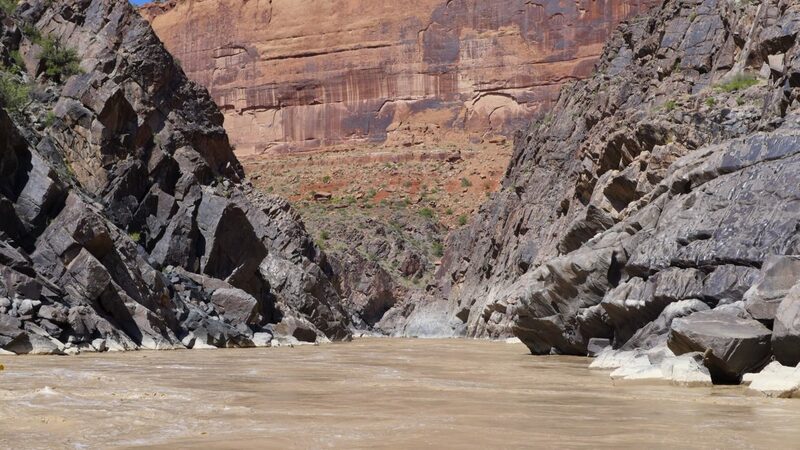 The coordinated high spring releases are meant to benefit four species of endangered fish that still eke out a living in the Colorado River between Rifle and Westwater Canyon. And the chub has recently been in the spotlight, as the U.S. Fish and Wildlife service announced March 22 that a five-year study has shown the chub could soon be downlisted from endangered to threatened. At the core of that recommendation was the relatively stable population of about 12,000 adult humpback chub that live in the Little Colorado River in the Grand Canyon, where the muscular torpedo-shaped fish evolved 3 million to 5 million years ago. There also are about 400 adult humpback chubs living in the Black Rocks section of the Colorado River, just west of Loma. And there are another 2,000 to 3,600 adults in Westwater Canyon just over the state line. Both population groups appear relatively stable, but their future is uncertain. A similar population group in the Yampa River, last seen in 2004, is now considered extirpated, meaning eliminated or completely destroyed. Regional water managers like Miller at Ruedi Reservoir also work together in late summer to release water to boost low flows in the 15-mile reach in the late summer. Last year, 79,038 acre-feet of late-season fish water was released from participating reservoirs. The water kept the river closer to the targeted-flow of 1,240 cfs instead of the 500-cfs-levels it was dropping to in August. 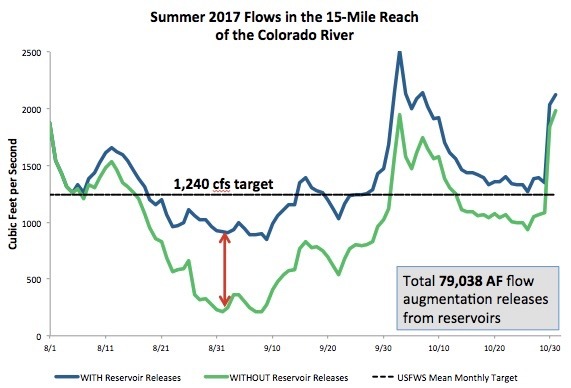 Of that 79,038 acre-feet released from the reservoirs last year for late-season flows in the 15-mile reach, Ruedi contributed 21,413 acre-feet of water, sending it downstream between Aug. 7 and Oct. 16. A graph comparing flows in the 15-mile reach from Aug. 1, 2017, to Oct. 30, 2017, with, and without, the release of fish water to benefit the 15-mile reach below Palisade. The target of 1,240 cfs has been lowered for 2018 to 810 cfs, a low-flow year target. 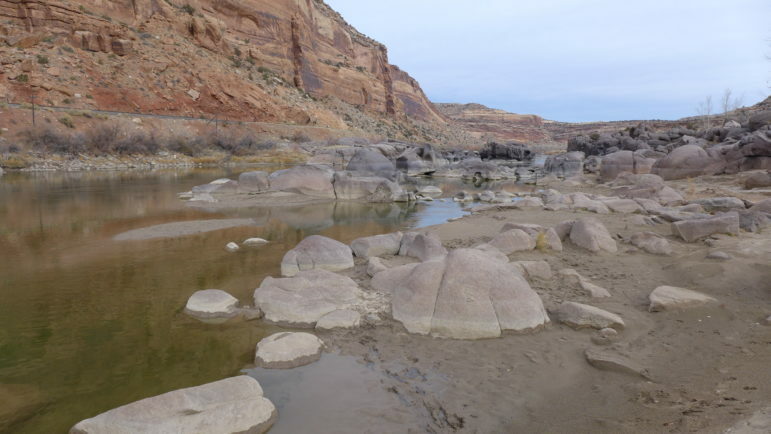 On last week’s conference call, officials with the fish recovery program said they intend to set a low-flow target of just 810 cfs for late-summer flows in the 15-mile reach, instead of last year’s target of 1,240 cfs. Editor’s note: Aspen Journalism is collaborating on coverage of rivers and water with The Aspen Times. The Times published this story on Tuesday, April 3, 2018. The Summit Daily News published it April 4, as did The Denver Post.